Ronald Evans was an American astronaut who served as Command Module (CM) pilot on Apollo 17. Evans received a B.S. in electrical engineering from the University of Kansas in 1956 and a M.S. in aeronautical engineering from the United States Naval Postgraduate School in 1964. He was a combat flight instructor for F8 jet pilots in 1961-62, after which he flew carrier-based combat missions for seven months. Having been selected as one of 19 new astronauts in April 1966, Evans served as backup CM pilot on Apollo 14 before taking the CM pilot's seat on board Apollo 17 and circling the Moon for three days while colleagues Eugene Cernan and Harrison Schmitt explored the lunar surface. He was subsequently the backup CM pilot for the Apollo-Soyuz Test Project, and then became involved in development of the Space Shuttle. 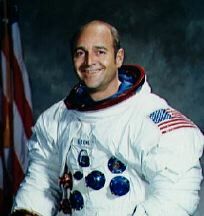 Evans retired from the Navy in 1975 and from NASA in 1977 to become director of Space Systems Marketing for Sperry Flight Systems.